The 4G ready Nokia 625 comes with a 4.7 inch screen, and 8 GB internal storage, expandable to 64 GB via MicroSD card. It sports a 5-megapixel camera with 1080p recording and a front-facing VGA shooter and comes in orange, yellow, bright green, white and black. If you're looking for a 4G capable smartphone on a budget then this is a great buy. It has good build and performance but has limited internal storage and a mediocre camera. If you're looking for a cheap, smooth running first smartphone, you can't go wrong this latest addition to the Lumia line. It's unusual to see such a large phone at the budget end of a range, so if you're keen on a big screen and 4G the Lumia 625 will certainly appeal. It's also fast and has a good camera. The Nokia Lumia 625 is a great value 4G phone, and currently the cheapest way to enjoy nippy 4G data speeds. The colourful designs and usual Nokia features give it plenty of appeal for all ages. The phone is colourful, has replaceable panels, strong performance and great build quality. When you compare it to its bigger brothers though it clearly loses in screen quality and camera credentials. A classic, colorful Lumia that offers LTE for a reasonable price. But, its obvious flaws mean it could've been so much better. The Nokia Lumia 625 doesn't have the same imaging credentials as its bigger brothers, nor does it have the most impressive screen in the business. If screen size is crucial, however, and you want to take advantage of super-fast 4G networks, it's an affordable option that's worth a look. The Nokia Lumia 625 is one of the cheapest 4G phones you can get. It's colourful, stylish and has the same Windows Phone 8 OS as other Lumia phones. However, the screen is disappointingly low in resolution. A huge, long-lasting smartphone at an exceptionally keen price - only the limited screen resolution disappoints. The Nokia Lumia 625 is a good smartphone that gives smooth, responsive performances and has a decent-sized screen. Battery life is impressive too. It's a good choice for anyone looking for a 4G handset that doesn't break the bank. For the performances on offer, it's a great-value buy. 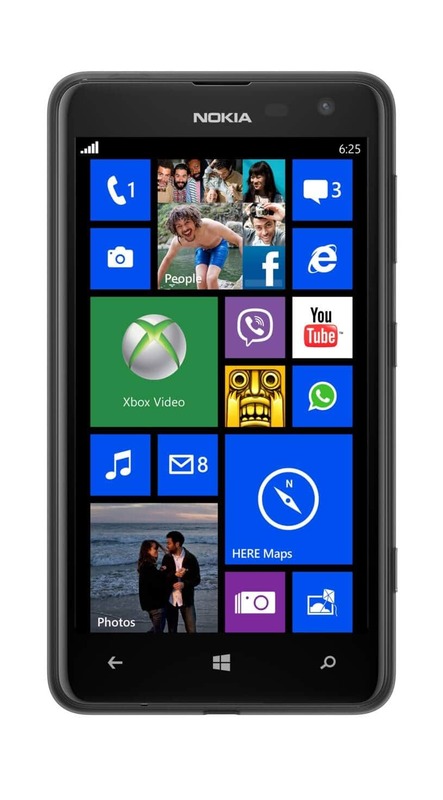 The Nokia Lumia 625 is a decent Windows Phone designed to offer budget buyers big screen usability and 4G speeds. However, with few of the custom Nokia innovations that made other Lumia devices great, it's unlikely to tempt new users to the Windows Phone platform. Considering the Nokia Lumia 625's super affordable price, it is quite a decent phone, and buyers on a budget are unlikely to find a better deal anytime soon.Our only issue is that the device is fairly dull, missing a number of the core innovations that made even Nokia's moderately more expensive previous Lumia's great. Every day, we search through thousands of tariffs and offers from UK online retailers to find the best Nokia Lumia 625 deals and contracts across a selection of price points and needs. Select 'Pay Monthly' if you're looking to get the Nokia Lumia 625 as part of a monthly contract with minutes, data and texts. Alternatively, choose 'No Contract' if you prefer to buy the Nokia Lumia 625 SIM Free or on Pay as You Go. Finding the perfect deal is easy. Just use the sliders to filter tariffs for minutes, data, monthly cost and upfront cost. You can also filter by network and retailer to find the best Nokia Lumia 625 deal for you! The cheapest contract price in this category is cheaper than buying the Nokia Lumia 625 SIM Free and a comparable SIM Only tariff by . You could save on the cheapest contract price in this category by buying the Nokia Lumia 625 SIM Free and a comparable SIM Only tariff separately.